The fields are blooming abundantly with golden buttercups, red sorrel and grasses. A lot of the herbs or weeds as we often call them are very healthy and are in fact healing herbs. I’m studying for herbalist now and it’s so wonderful to discover all their benefits for our body and mind. I thought it would be nice to share some herbal portraits once in a while. A little background about the naming, its appearance and benefits and how to use them in our daily life. I think it’s part of living a more natural and sustainable life when we can have our own plant pharmacy and know how to use these herbs for little ailments. This morning I came across a field where chamomile was growing. It isn’t easy to find a place here where it’s not growing close to the road or where farmers might have used pesticides on the fields. So I was utterly happy when I came across this natural place! 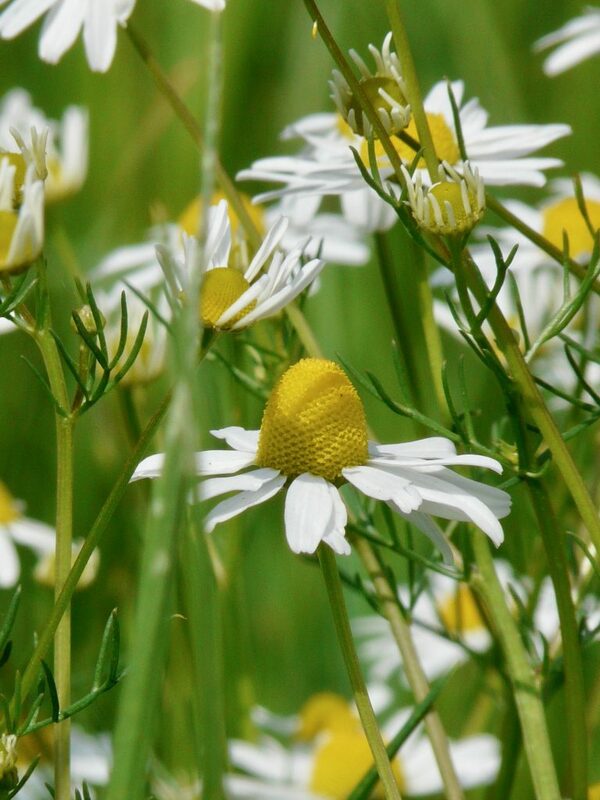 There are many types of chamomile but I’m talking about the “real” one that is used in herbal remedies. It’s Latin name is Matricaria chamomilla. 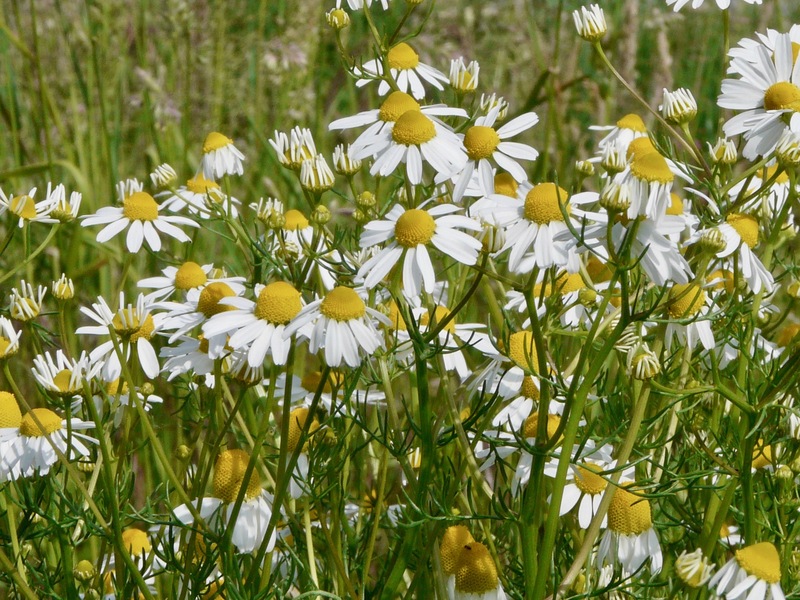 Chamomile is also called ‘chamaimelon’ or ‘apple on the ground’. And indeed when one cuts the flower head in two, you can smell the subtle scent of green apples. 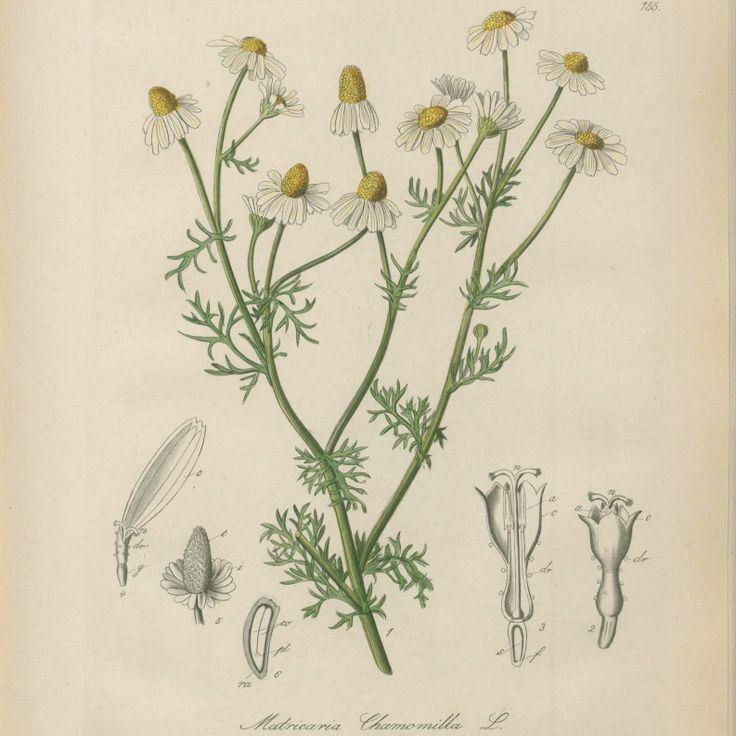 Matricaria can relate to the Latin word ‘matrix’ (womb) or ‘mater’ (mother) and ‘cara’ (lovable) because this plant was used to heal women diseases. 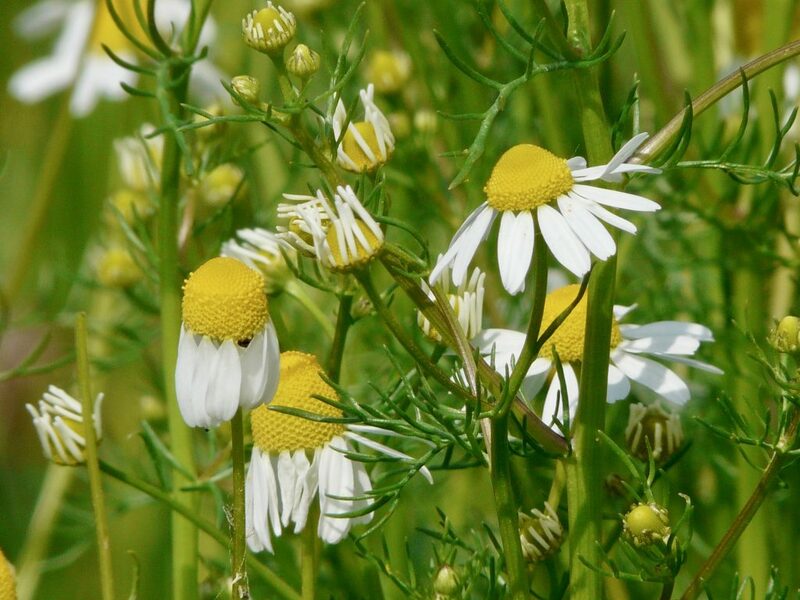 Chamomile is one of the best healers among herbs. The flowers soothe, heal and restore the skin. It works as a relaxer, making it great to treat anxiety and insomnia. Due to its anti-inflammatory properties, it works well to treat gastritis as well as inflammations in the mouth and eyes. Externally it can reduce swelling. Do your remember the stories of Peter Rabbit of Beatrix Potter where Mrs. Rabbit gave the little ones a cup of chamomile tea before they went to bed? Well, that’s one of the main uses of chamomile. To make a pot with fresh flowers, you’ll just need 3 tablespoons of fresh flowers (~1 tablespoon of dried) to make a pleasingly fragrant cup of tea. Cover the blossoms with boiled water and allow to steep, covered, for ten minutes or so. You can mix them with lemon balm as it has the same soothing and calming effect. Serve warm and enjoy! Fresh chamomile flowers also make a pretty edible addition to your food, such as cakes, fruit salads or cold drinks or put them in your ice cubes! I sometimes make a hair rinse with rosemary and chamomile. Rosemary stimulates the blood flow of the scalp and make your hair shine. They both have antibacterial qualities. Boil 1l water and add 5 tablespoons of fresh (or dried) rosemary and 5 tablespoons of fresh (or dried) chamomile. Remove from the fire and let it rest for 2 hours. Sieve the liquid, rinse your hair with it after your usual hair washing and enjoy the shine! 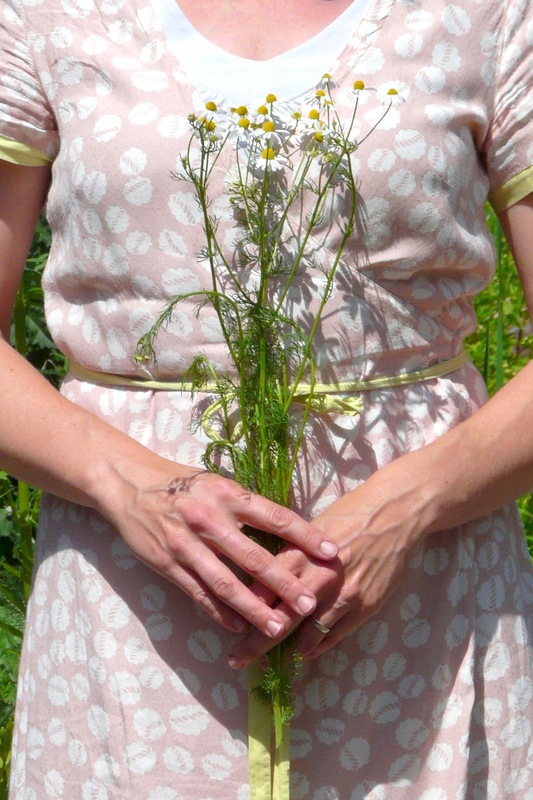 Chamomile needs to be harvested on a sunny and dry day. You can pick the flowers best before 11pm when the essential oils in the flowers haven’t been evaporated. The right time to harvest the flower heads is when their white petals are horizontal and splayed out in a flat circle. Then spread the flowers on a tray lined with a dishtowel to let them dry. Don’t turn the flowers as they can lose their petals. They should be dry within 5-7 days when it’s beautiful weather. Then store the dry flowers in brown paper bags. A botanical illustration which is useful to determinate the plant when you’re out in the fields. 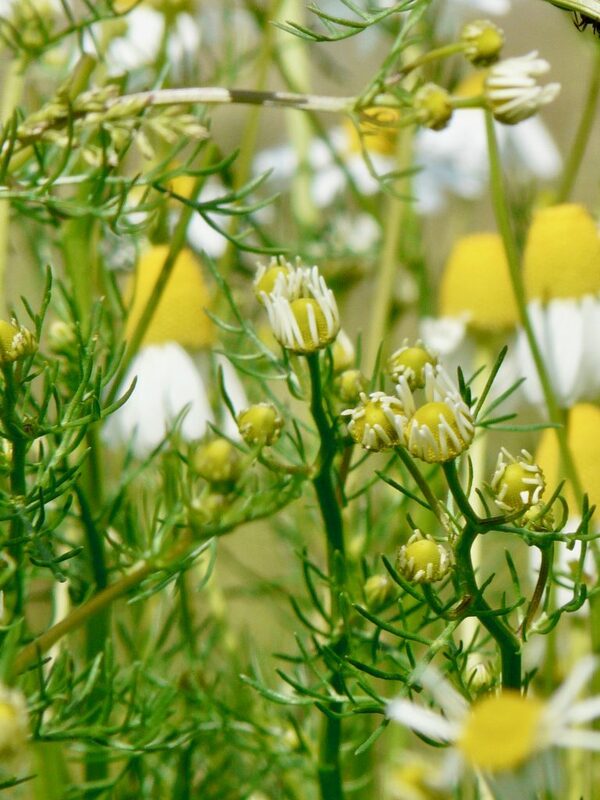 If you aren’t sure whether it’s the real chamomile or a similar variety, just cut the the flowerhead in two and when you see a little hollow space (like a womb, cfr. naming) you know for sure you have the right herb! As you can see there a lot of varieties of the chamomile. 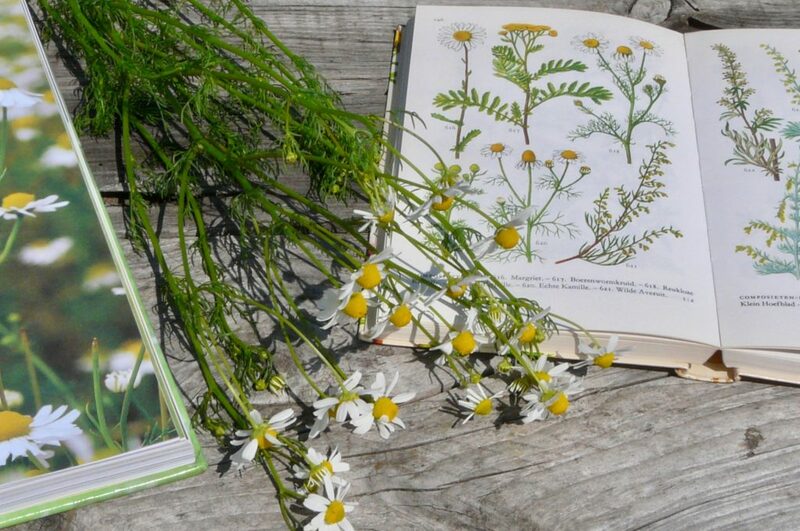 Lots of people have for example feverfew in their gardens but it’s quite different from chamomile (which has more fine feathered leaves, a conical flowerhead and it’s specific refined scent). 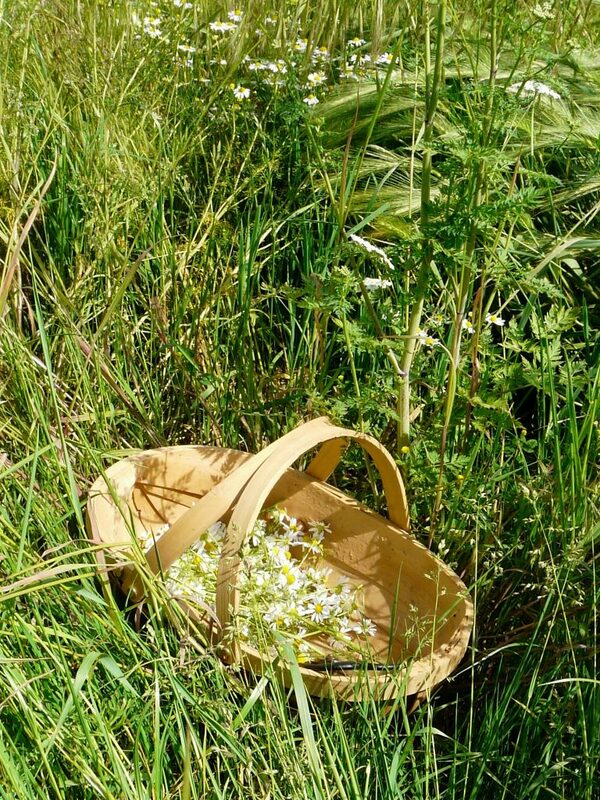 Chamomile loves the sun and blossoms from May until september and it sows itself each year. I would love to hear if you have a favourite use of chamomile or would like to share a recipe! Or if there’s a herb you would like to learn more about, for the next herbal portraits. Hello Vicki, I’m glad to hear you liked this post!